2/11/13 Was pondering Niddah and it’s spiritual application in my drive time today.. Remembered, vaguely, something I’d heard some time ago, so went looking. First use principle in Scripture – From Torah, the time of a woman’s period, when she is set apart and separated – best described in Lev 15. Next “major use” (as in used more than once in a specific context) is for the red heifer ashes water of separation (Num 19:9), which is used for the purification of sin. RM: If I may add to the ponderings. How about the aspect of “US” being the “Bride”? Just a thought! SBS: Hmm. Your ponderings never cease to amaze me. It would make an interesting study for sure. I wonder how this might shed light on the woman in the NT with the issue of blood. MD: Hmmm….. both good thoughts to ponder thru!!!! MD: My starting point is Yeshua’s words that if they, the Jews, had believed Moses, they would have believed in Him. This tells me that we will find Yeshua thru-out the Torah, even in the midst of places that don’t make sense in the natural. The law of jealousy, for instance is one of those – but when we realize that Yehovah had reason to be jealous of his bride, and that Yeshua drank the bitter cup for us, saving us from the curse of that cup, the deeper parrallels become so beautiful! Niddah is another one of those make you scratch your head. If any man touches her, or the things she sits on while she is in Niddah, then they are unclean/defiled – but only until evening as opposed to unclean and needing to offer a sacrifice. The word for unclean/defiled is tama which in pictograph is a “leader contained in chaos”. I believe there MUST be a shadow picture of Yeshua or his ministry in this, and I sense it’s tied to the two separate uses of the word Niddah. Applying Niddah to the Bride of Christ is a very interesting thing to ponder out… the woman’s niddah being a picture of something which happens within the Bride… the red heifer ashes water something which comes about by the Groom/Yeshua?? Since I don’t have the answer to this completely, I appreciate other ponderings and study on the subject. (ten days later…) MD: This is likely TMI for FB, but at the same time, if someone isn’t honest about what occurs in the natural, the spiritual metaphors will be lost…. So, I’ll take the risk of giving TMI…During Niddah, I always feel a drawing inward. It’s a strong pull to slow down, to “go inside”… I’ve used the word “introspection”, but that didn’t fit well. The Inward pull is more than introspection tho that happens. It’s more than just drawing into myself for a few days…. Niddah is when the physical (body, chemistry, cycle) calls the spirit and soul of the woman to go deep into the Him Space – He in Me. It is the experience of being set apart into the waters of cleansing and healing of Yeshua. I find it to be a time when music and verse and conversations and all about me just accentuate this deep spirit to Spirit communication that is taking place when I allow myself to slow down enough to listen. Often no real words are spoken, but I find myself keenly aware that I’m deep in conversation with the Giver of Life and Love. As the old home for life is shed and cleaned away in the natural, so too, the old is being released and cleaned away and my soul prepared to host New LIFE. 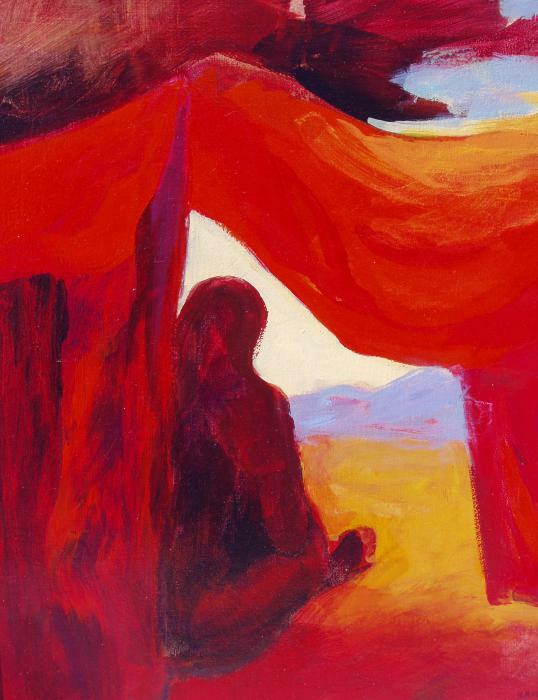 For me, the “red tent” of ancient times, is simply that a metaphor for the place where I meet Him in Me, where I slow down and take in all He has to cleanse and refresh my spirit for the month ahead, to be a fit vessel for the LIFE which He will offer the world thru me. So, yeah… we, His bride… Called apart for a time to be cleansed, to be prepared to be the VESSEL of Honor and LIFE offered the World. SBS: You make it sound so lovely. I always thought the red tent was merely to prevent murder in the camp. 😉 Seriously though, I’m glad it’s beautiful for you. It’s not at all for me, even when I do slow down to pay attention. For me, there isn’t a spiritual meaning to it. I’m a body. It happens. And then by God’s mercy, I move on. I know enough to know that the process is doing something vital in the physical, because of how out of sorts I am if I miss a month, and you know me and my interest in body theology – so I have to believe something deeper is probably happening. If nothing else, the chemical wash of hormones is effecting emotions, etc, and maybe I could see something I don’t usually. But even so – it’s still miserable, no matter how much I try to embrace it – and not just physically, though that too. It’s when I’m mentally and psychologically at my worst. MD: 😀 on your red tent thoughts. Once upon a time, my cycle was a thing to be endured, grudgingly. And then, in my late 20’s or early 30’s, I was visiting my mom, who was reading “The Wisdom of Menopause” by Christine Northrup MD… I spent some time reading it also and it planted seeds of thought to perhaps see the time of the red tent as a blessing, and to work with it, rather than against. So, I’ve been in the place of open to possibility that it was something more than to be endured for 6-10 years now… But it’s taken a long time to truly embrace it, and even longer to find the beauty and be grateful for Niddah. Point being, keep being gentle with yourself, and your body. You’re on a journey, He will finish the work He began in you of healing. Who knows – a few years from now, you might find niddah as a beautiful place where there is only a bit of pain to face bravely and quietly…. He is in the business of restoration. SBS: I like your hopes for me. I think too that I struggle conceptually because of the stage of life I’m in too. I feel like I wasn’t such a nutcase around this time when I was still married. There were times it felt like a sign of failure, especially when we were trying to expand our family. But for some reason, it felt more natural in that context. Now, it just feels useless, if that makes sense. It’s a reminder that my clock is ticking, a clock that may never be fulfilled. Too, and I was thinking of this the other day after your first post, I wonder if it’s evidence of a feminist God. (I don’t mean feminist in its icky political sense – only in the sense that women are human). Put yourself in that day. All the women of the household have their bodies synced up together – it just happens – so potentially, *all* the women close to one another are in the red tent at once. Seems like someone has to keep the household going in the meantime. Maybe it’s younger daughters, or maybe it’s sons, or perhaps neighbors step in (though who is to say that the neighbors aren’t red-tented too? ), but it seems like somehow, the men are going to have to step into household routines and childcare. Could be completely wrong – and in times of war, I do think my theory maybe flops. Elders maybe step in too. But what I’m saying is that in a practical sense, it would seem like having all the women in a family outside the camp at once is a very real reminder that women are *human* and we have limits. It doesn’t level the playing field, but in some ways, it’s an enforced extended sabbath rest. I mean, gosh… can you imagine today if Mosaic cleanliness laws were enforced? All the women of child-bearing age in town exiled to the outskirts? What kind of crazy party would *that* be?! I’m thinking wine, I’m thinking chocolate, I’m thinking some whining about men and communal therapy, I’m thinking sleeping in and staying up late. Might be a good deal, you know? Of course, things are different in our day, and there are wonderful men that shoulder household duties all along, and for women who work outside the home (or school outside the home), it would be crazy-inconvenient on all sorts of levels. But in that case, maybe it *does* prevent murder in the camp – it’s retreat and rest from what otherwise might be a hard life for women. And absence makes a heart (and other things) grow fonder – strengthens families, perhaps, marriages perhaps, ensures a bigger family line… There seem social applications here as well. MD: I love your thoughts here… they mirror some I’ve thought in the past on the subject. Yeah..
SBS: OMG, can women professing to be Godly *speak* of such things? Seems like we have a culture that thinks it has the corner on intimate things – but for culture, it’s not intimate, but crass and shallow and surface – the appearance of scandal, which makes it all the more scandal. Sometimes, I think a woman should be able to talk about a uterus in mixed company without the world coming apart. So yes… I *have* thought about the onlookers. But this seems far more holy than all the crap we put up with from media and entertainment all the time. When will we stop apologizing for being women in the church? I get propriety, and modesty, and it has it’s place. But the Bible speaks freely – Women bleed. They’re deemed unclean. Put them outside the city gates. And this is how you become clean again. Facts of life. Welcome to the kitchen table, folks. If we could talk honestly about circumcision there, we can talk about uteri too. DL: love the ‘blog’ on this thread. must needed REAL info pertaining to the life givers..WOMEN:) we as humanity have been taught to see what YEHOVAH said is blessed and part of HIS LIFE giving, as ICK!! then saying it to ourselves and others speaking it at least as i can rememeber since i was 12!. YET…since i have made it through men tal pause…o what a word, again!…i praise ABBA for the times i did bleed and tell my daughter the same thing. I have sent this thread to her hoping she will see it as it is typewritten from the heart that wants to know along with the outloud pondering of the heard through it all!!! thank you MD and SBS and those who joined in. this is not ‘down and dirty’ YET uplifting and life source!”…yea to wo man and to the MEN whom choose to know and respect the ‘order’ of all of ABBA”S instructions for our ‘bodies good’ and for good life. I love the play on words with men tal pause!! That is so accurate! and what Christine talks about in Wisdom of Menopause… it is a time of mental pause. If a woman doesn’t take her Niddah to deal with the pain within, it will show up post partum, and if not then, in menopause, and if not then, early death is HIGHLY likely. However, if she takes the time in Niddah, and post partum, and men tal pause, to pause, to think, to reflect, to heal, to grow she comes thru the mental pause and moves from being a home focused life giver, to a world focused life giver. Healthy woman who have passed mental pause well, are the vibrant ones who offer LIFE in a hundred ways – from starting new businesses, ministries, to writing books of substance, to mentoring and loving well. Truly beautiful!! Indeed – welcome to My Kitchen table!!! Gotta clarify tho, for any not familiar, Scripture doesn’t actually say put her outside the city gates. It says a man who touches her during Niddah will be unclean until evening, after he takes a bath. But the application of that in ancient culture was reportedly a set aside “red tent” for the women to stay in during Niddah. Yeah – truly. Facts of life. Women bleed. They need set apart time. This is about their gifting as Life Givers. It is needed, necessary and GOOD. DL: yes, copied it and pasted…thank for seeing the play on men tal…tis my ration al….hehee…yes on the ‘brother’ pulling up a chair where most wouldn’t! must be a truly good man! Late to this conversation. It’s been too busy, almost wish I qualified for some Niddah time for more inner work! Glad I sat down to your kitchen table before noon! Wonderful ponderings. There is a problem when we build our theology on the fictional works of writers who admittedly are not portraying ancient Israel as it was. This is clearly the case with Diamant and her book The Red Tent. Just so you know that there is absolutely no evidence that women were set outside the camp in a red tent during their menses. This is a complete misunderstanding of the laws of YHVH and His will regarding the treatment of the niddah. However, I’d love to hear more on your theology on what YHVH’s will is regarding the treatment of niddah. I’m still very much learning, and appreciate all points of view!